For decades, Betty dreamed with WUPJ of building strong Progressive communities in the Former Soviet Union. She lived to see the fulfillment of this dream and continued to support these important institutions throughout her lifetime. A former Vice President of the World Union of Progressive Judaism and a long-time member of its Executive Board and North American Advisory Board, Betty spearheaded the World Union’s efforts to rebuild Progressive Jewish religious and cultural life around the world. In 2006, the World Union honored Betty with the International Humanitarian Award its highest honor, bestowed upon individuals who embody exemplary service and leadership to our movement worldwide. As a district President and member of the Executive Board of Women of Reform Judaism (WRJ) and as a member of Union for Reform Judaism (URJ) board, Betty strengthened the values of Reform Judaism across North America and in Israel. She also served leadership roles in ARZA, the American Reform Zionist Association. 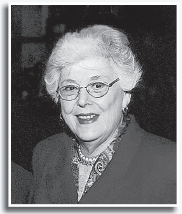 Betty was a devoted member of Central Synagogue in New York City, and for years with her late husband, David (Dan), was a charter member of the Community Synagogue of Port Washington where she served as Trustee and President of its Sisterhood. Betty was a dynamic and inspirational leader whose service and dedication spanned a lifetime. She will be sorely missed by so many whose lives she transformed and by those of us who loved her. Betty is survived by her children Rabbi Paul, Hank and John, their spouses and beloved grandchildren. May her memory continue to bring blessing to her family and the Jewish world she cherished. The Golomb family has requested that all donations in Betty’s memory be made to WUPJ. Please fill out this form to share "The World Union Mourns the Passing of Betty Golomb z”l" via e-mail.